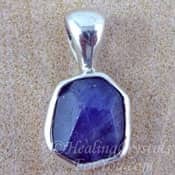 Crown chakra stones are of immense value to stimulate areas of the body that are related to your spiritual growth or to heal particular health problems. This chakras function is to manage specific areas of the brain, the pineal gland, the pituitary, the nervous system and all master glands. 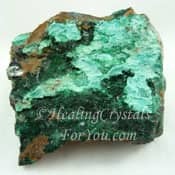 Changing your life can be assisted by using crystals, but it is important to use the correct crystals or stones that relate to the meaning of this chakra to get the best results. The 7th chakra is the area of the body where the functions of higher consciousness, spirituality and your commitment to higher ideals originate. Crown Chakra Explained... Where Is The Crown Chakra? Crown Chakra Explained: the crown chakra meanings relate to spirituality, selflessness, empathy and humanitarianism. This chakra is associated with the pineal gland, (also related to the third eye chakra) and with all of the master glands. 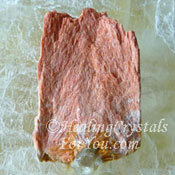 This chakras meaning is all about the idea of 'knowing' especially in a spiritual way. 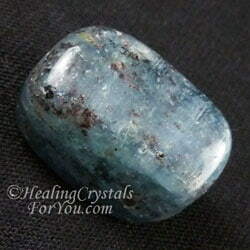 It is strongly related to the gift of psychic knowing, and is the area where you connect with your higher self, and it also pertains to intelligence and deep thought. 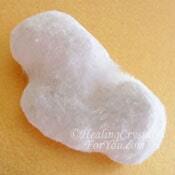 The crown chakra or 7th chakra is located just above the top of the head. As this chakra is located at the very top most point in the physical body, it is the point where spirit introduces energy for distribution throughout the body. The soul star or eighth chakra sits above the seventh chakra, and and links to the higher transpersonal chakras via the stellar gateway, that is above that. Spiritual energy enters the body via this chakra, and this brings the energy down from the higher transpersonal chakras into the body. The Crown Chakra Explained Simply: Values, high ethics, service to others, humanitarianism and sensitivity to the environment emerge from this chakra. Most people who choose to work with the highest chakra in the body are already aware that they are on a path of a metaphysical or spiritual nature. 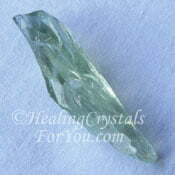 Sometimes though you may not have been listening to what spirit was trying to tell you. If you have missed what was being said to you, what you are currently reading may be spirit's way of speaking to you directly. The ideas and fundamentals of coincidence and synchronicity is a principle closely related to this chakra and can aid the growth of spirituality. What I am talking about is where you simply find out about something you need to know almost by 'accident'. 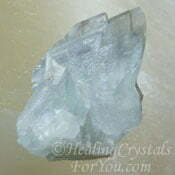 This may be spirit assisting you to see where you might go on your life path. 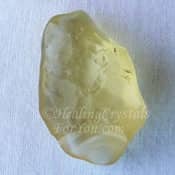 If you have been drawn to using certain crystals, and especially the high energy stones that stimulate this chakra and are not really sure why, this might be this process in action. 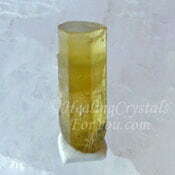 High vibration crystals will work simultaneously on the 4th, 5th, 6th and 7th chakras and the transpersonal chakras which are above the crown chakra. 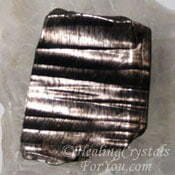 This is because all of the chakras from the heart chakra up are concerned with spirituality and healing. 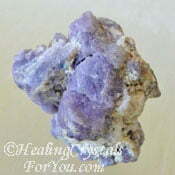 It is necessary to ensure before using the specific crown chakra stones that all of your chakras are in alignment. 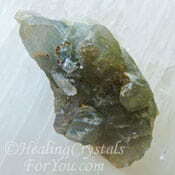 Kyanite is a most powerful stone to do this quickly and effortlessly as it will bring all of the chakras into alignment. 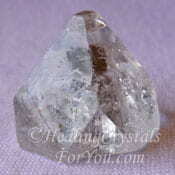 Aligning your chakras should to be done often, as problems may occur that you were not aware of. 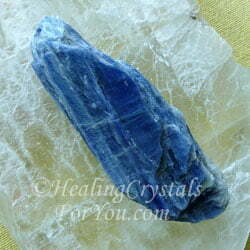 Kyanite comes in many colors, but for the crown the most common Blue Kyanite or the Indigo Kyanite are recommended. 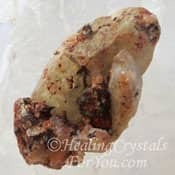 These stones are powerful healers as they bridge any energy gaps which may have been caused by any sort of accident, including broken bones or from surgery. 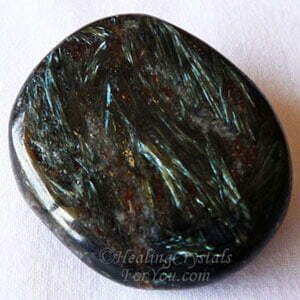 All colors of Kyanite emanate potent energies that stimulate the pineal gland and may activate dormant psychic abilities. 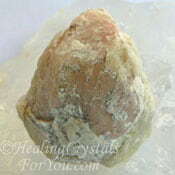 If the crystals you've been using are any of the crown chakra stones, it is almost certain that you are being called to take action. 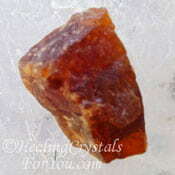 Whether or not you have previously used any of these stones, now may be the time to look at this group of powerful crystals. 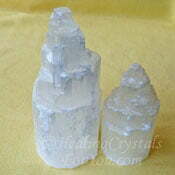 The crown chakra resonates most strongly to the colors of violet and white. 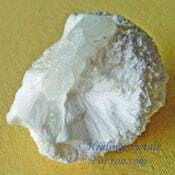 White is a combination of all of the colors, and the white light is an emanation of the Goddess/God. 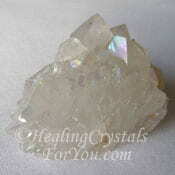 In most forms of spiritual or alchemical healing, the concept of white light is widespread. 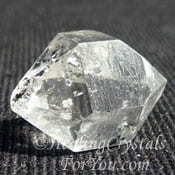 It is from the crown chakra that the white light emanates and this chakra is our connection to the Divine Mind. 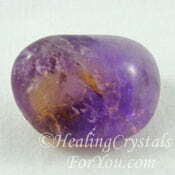 Many crown chakra stones are not the specific chakra colors, but this is okay as they will still assist in developing this area. 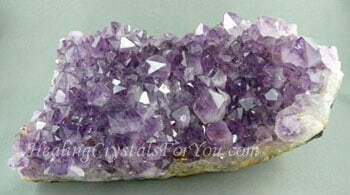 There are many white, violet and clear stones for this chakra, such as lovely Amethyst Crystals. 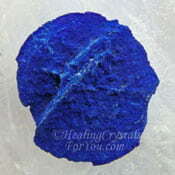 Anyone who feels they need to improve the energy and flow in any part of this area should use any of the crown chakra stones. 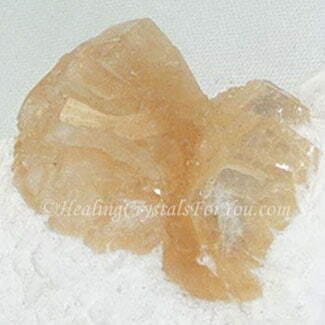 As this chakra overseas and governs the functioning of all chakras, using the specific crystals for healing this area will also heal the whole body. 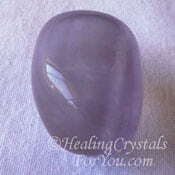 Most crown chakra stones are quite powerful. 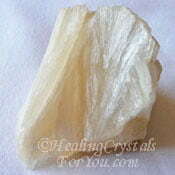 If you are choosing to work with them you are probably aware that you are on a spiritual journey. As the pituitary gland secretes hormones that balance our whole system, it is important that this area is kept healthy. 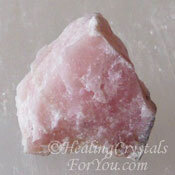 There are many crystals that will help you to develop your spirituality via the seventh chakra. 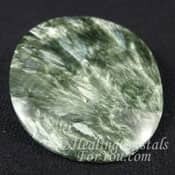 Some of the stones for this chakra that I have used that are most helpful are listed below, and as the list is quite long, it is located at the end of this article. 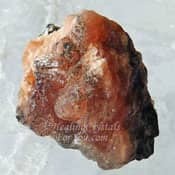 Who Should Use The 7th Chakra Stones? 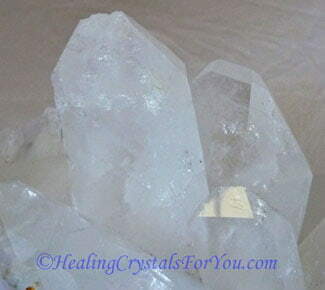 Changing your life can be assisted by using crystals. 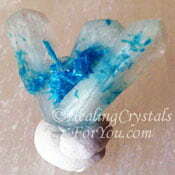 It is of value to use the correct crystals to stimulate areas of the body that require help. 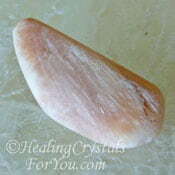 Once you work with these stones you may open your crown chakra, as you begin to make contact with spirit. This is quite common, and necessary for many spiritual practices, and this chakra will normally close naturally without any effort within a few hours. 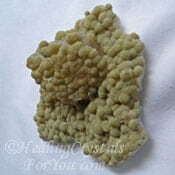 You may choose to use Muscovite to both aid with spiritual development and to prevent the side-effects that you may (not always) get from opening up spiritual or psychic gifts. This will also prevent any spaciness that may happen. 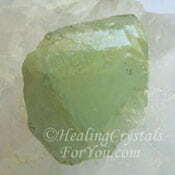 If you feel spaced out this may be a sign that this chakra is open. 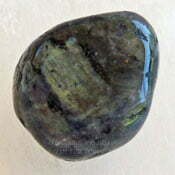 If you have a spacey feeling and it bothers you, in future be sure to keep one of the grounding stones close by, to aid you to be properly grounded after doing spiritual work. 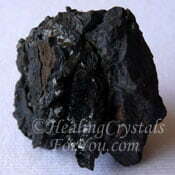 To help to close any of the chakras, hold any of the many base chakra stones, including the black stones such as Black Tourmaline, Black Andradite Garnet, Tourmilated Quartz or Black Obsidian in your hand. 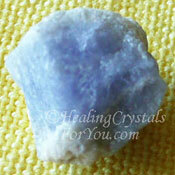 Why Would You Use Crown Chakra Stones? 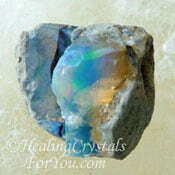 If you would like to develop the gift of psychic knowing, this may happen once you start working with specific crown chakra stones. 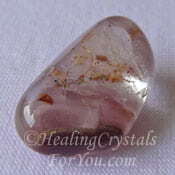 Psychic knowing is unusual in that the information is delivered directly from spirit to your mind, and although it happens quickly it is actually following a specific path. The information in the form of thoughts, or spiritual energy, enters via the crown chakra into the nerve bundle in the center of the brain, and they are immediately available in your thoughts. 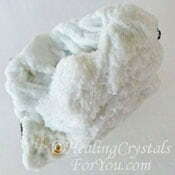 The crown chakra is the most highly spiritual of the seven major chakras within the body. So it is the most powerful chakra for spirituality, not including the eighth chakra or soul star chakra and the other transpersonal chakras. 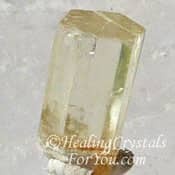 Keep any of these lovely crystals within your aura, and it will assist you to heal health issues within this chakra, and it may enhance your connection to the Divine Mind and your higher self. 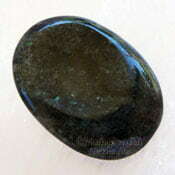 Many beautiful stones of these colors are easily obtained. 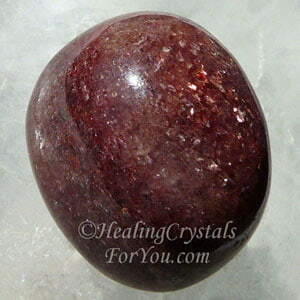 It is easy to buy stones for this chakra, so take a look at the stones mentioned here to see what you need. 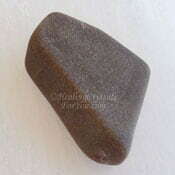 Even having a few tumble stones in your pocket will keep them close to the area that they benefit. 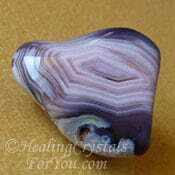 One of my favorites is the quite beautiful lavender purple Sugilite stone. 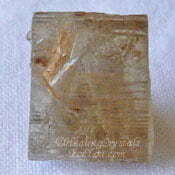 Some books and jewelry stores have labeled it as "the premier love stone", but it offers much more. 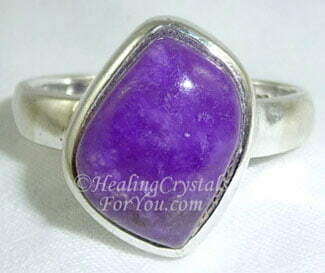 Sugilite rings and other jewelry made from this stone is wonderful to wear. 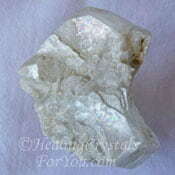 This lovely crystal is a strong spiritual grounding stone, and it is a wonderful stone for psychic protection as well. 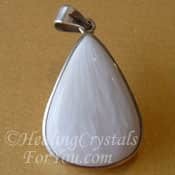 This is very useful when you begin any psychic exploration, to have protection from any entities that may be attracted to your 'light'. 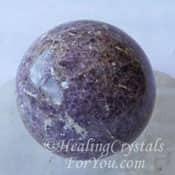 The combination of Amethyst Crystals with Sugilite, both powerful crown chakra stones, will elevate the level of psychic protection. 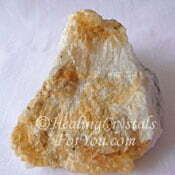 This crystal combination is also very effective for overcoming addictions. 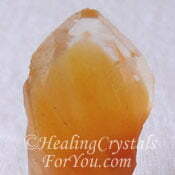 How Will Crown Chakra Stones Help You? 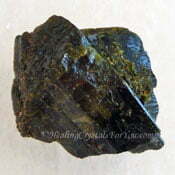 To gain the greatest advantage spiritually you might choose to make use of high vibration healing stones. 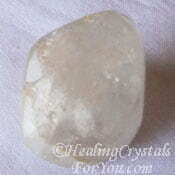 Using any of the strong crystal energy stones will be most advantageous to this chakra. 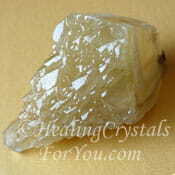 After the use of certain high crystal energy crystals, you may find new ways of thinking could emerge. 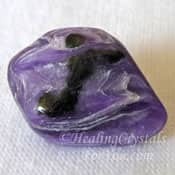 Some of the crown chakra stones or crystals will be easier to get than others, but if you are meant to have one it will turn up. 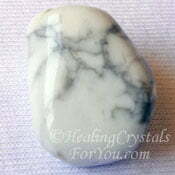 Look for any of these stones, as they are excellent to develop any of the psychic powers. 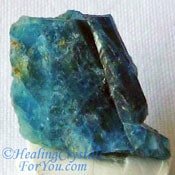 Take note: as mentioned above, that there are quite a few stones with a strong level of crystal energy that you may choose to use. 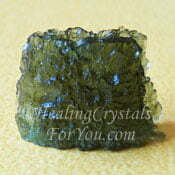 Both Herkimer Diamonds and Moldavite are now more common in good crystal shops. 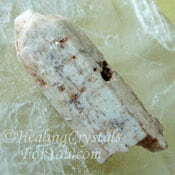 Some of the other high frequency stones are classified as rare crystals, and they can be a little more difficult to obtain. 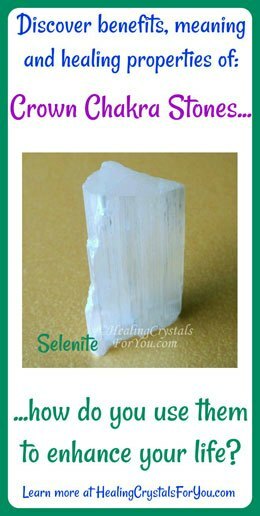 Selenite, White Heulandite, Nirvana Quartz, Herderite, Petalite, Herderite, Stellar Beam Calcite, Danburite, Scolecite, Tanzanite, Natrolite, Datolite, Star Hollandite Quartz and Phenacite are stones you might choose. 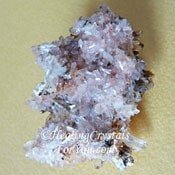 These crystals are on the list of my favorite high crystal energy stones, and all these are potent stones for accelerating spiritual growth. 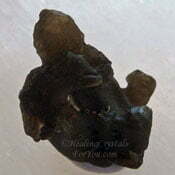 These high vibration stones are now known about more widely, as more of you embrace spirituality and healing. 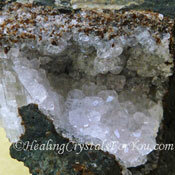 Crystal jewelry made from any of the violet or white crystals including clear quartz is recommended. 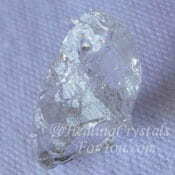 There are beautiful pieces of crystal jewelry made from many of the 7th chakra stones. 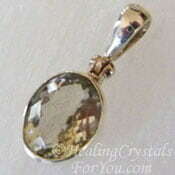 Wearing earrings made from Labradorite is powerful, and it keeps it higher on the body and close to the crown chakra. 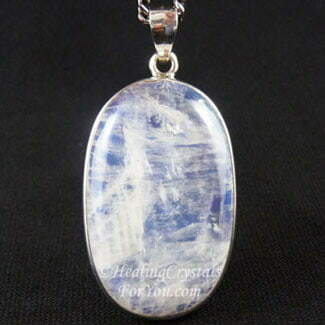 Both Labradorite and Rainbow Moonstone Crystal are powerful stones to wear, and make extraordinary jewelry pieces. 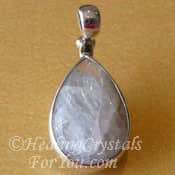 Many women report astonishing shifts after beginning to wear Moonstone, as it is the stone of the "Goddess". 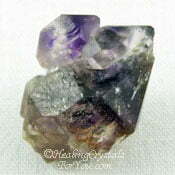 Wearing purple crystal jewelry, made from any of the violet flame stones will create amazing healing results. 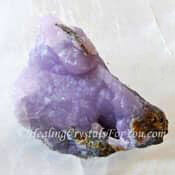 Some of the most well-known purple crystals are also known as stones that bring through the violet flame, including Sugilite, Tanzanite, Purpurite and Amethyst Crystals. 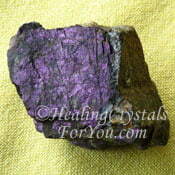 Another beautiful purple stone, that is also protective, is Charoite. It brings the added vibration of "being of service". It speaks to all of us who not only wish to be spiritual, but to bring these gifts to the world so that everyone can benefit. 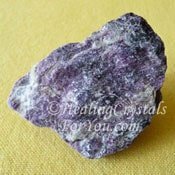 Lovely Purple Amethyst jewelry is easy to buy, but any reputable crystal shop will have pieces in one of the listed stones for this chakra. 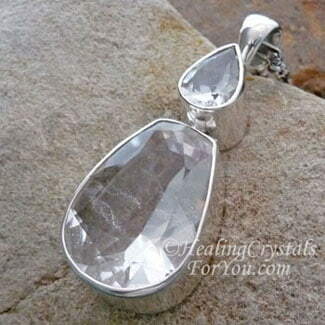 Many jewelers keep crystal pendants and rings of either purple or Green Amethyst, which are not only powerful stones but are also lovely to wear. 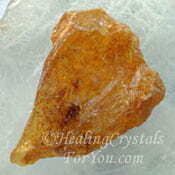 As you use crown chakra healing crystals you may enhance the abilities of this chakra. 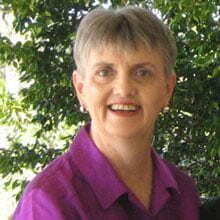 As deep joy becomes a part of your daily experience, you will become what you most want, truly happy! As you allow yourself to open to the flow that comes to you from the universal mind, new spiritual abilities come forth and new ways of thinking emerge. "It is not in the stars to hold our destiny, but in ourselves" William Shakespeare. 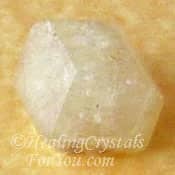 There are a large number of crystals that stimulate this chakra and although there are quite a few pictures above there are too many to feature here on this page. 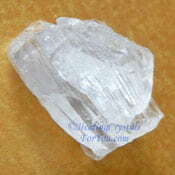 Tanzan Aura Quartz, Tibetan Black Quartz, Tiffany Stone aka Bertrandite, Tourmilated Quartz, Tremolite, Ussingite, Tugtupite, White Aventurine, White Cacholong Opal, White Calcite, White Scapolite,White Fluorite, White Topaz aka Clear or Silver Topaz, Winchite and Zircon. Some of the stones discussed here have had specific pages written about them.